The Brabant Ensemble under their director Stephen Rice presents music for the dark time of the year. 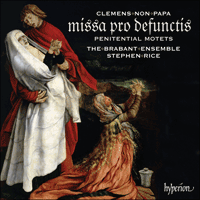 Its latest disc of 16th-century polyphony features the extraordinary compositional gifts of Clemens non Papa, put to the service of the Requiem Mass and a selection of motets on a pentitential theme. Within this general aspect of solemnity can be found countless shades of expression and emotion. Despite the popularity of the composer’s music during his lifetime, Clemens is a somewhat marginal figure today and many of these motets have never been recorded before. Yet, listening to this music today, one is immediately enthralled by its opulence and harmonic lushness, very different from the occasionally sterile polyphony of some of the composer’s contemporaries. The Brabant Ensemble’s fresh, uncluttered and sincere performances truly bring this glorious music to life. The second aspect of Clemens’s writing that draws the listener’s attention is the manipulation of harmony. To use the word ‘harmony’ in relation to sixteenth-century polyphony is to invite disapproval from those who believe the term anachronistic; but (partly for the reason elaborated in the last paragraph) I believe that Clemens can usefully be viewed in such terms, to a considerably greater extent than his contemporaries. Although passages in block chords had been present in sacred music for many years before his time, generally at moments of extreme solemnity such as the name of Jesus Christ in the Mass, on numerous occasions in the motets presented here Clemens blends chordal writing into the wider flow of the polyphony, in order to achieve effects that seem more to do with form or even more abstract concepts, than with illustration of the text. An example is found in the short (and very unusual) motet Vae tibi Babylon et Syria, which takes a text from the Apocryphal book 2 Esdras concerning the impending annihilation of cities hostile to the Jews. The inhabitants of these cities are invited to clothe themselves with sackcloth and hair shirts: this line of text is extended over nearly two minutes of music, in which the somewhat aggressive stance of the piece’s opening is gradually wound down towards the subdued ‘plangite filios vestros’ (‘weep for your children’). The motion of the bass part is slowed to semibreves and breves while the upper three voices gradually sink sequentially over the range of an octave. The evidently deliberate reduction of tension in this passage creates a sense of exhausted despair that can only partly be broken for the final text ‘quoniam appropinquavit perditio vestra’ (‘for your destruction is drawing near’). Elsewhere in his motet output Clemens adopts other formal strategies that seem independent of text expression. In the large tripartite motet De profundis, which sets Psalm 130, for instance, the first section ends with an extended downward sequence at ‘Domine, quis sustinebit?’ (‘Lord, who could bear it?’). The texture is full at this point, with the lowest two of the five voices moving steadily in minims and in parallel thirds, while the soprano and one of the altos adopt a dactylic rhythm (semibreve–minim–minim), again mostly in parallel motion. Meanwhile the quinta pars or second alto is far more rhythmically active, syncopating with semiminims and minims against the prevailing tactus. No voice straightforwardly underlays the text (and the sixteenth-century sources are unhelpful in their underlay indications), reinforcing the impression that this passage was conceived as a sonic unit rather than specifically with the expression of these words in mind. This is underlined when a reworked version of the same sequence reappears at the end of the final section, but this time in triple rhythm, so that the four beats of a sequential unit in the first statement make up one-and-one-third breves rather than one breve, and the accentual pattern is ingeniously displaced. If such quasi-instrumental passages suggest a composer most closely attuned to sonority, elsewhere in De profundis Clemens refutes any suggestion that he might be oblivious of textual concerns. Earlier in the third section, the word ‘misericordia’ (‘mercy’) is treated homophonically and with perfect Humanist word-stress; and towards the beginning of the piece ‘Si iniquitates’ (‘If [you should observe] transgressions’) is not only sung homophonically but repeated at a higher pitch for increased emotional effect. De profundis as a whole is one of Clemens’s most impressive achievements, running for nearly ten minutes as a freestanding musical structure. Matching it in scale is Tristitia et anxietas, slightly shorter in terms of note values but even longer in performance. This motet has long been known to students of Renaissance polyphony for its apparent influence on the setting of the same text by William Byrd, first noted by Joseph Kerman; however, like the majority of motets presented here it does not appear to have been recorded before now. Its anguished tone is set by the opening imitative point which, in the manner of Clemens’s distinguished older colleague Nicolas Gombert, winds slowly and tortuously around a single pitch, with an opening movement of a semitone. Other obvious emotional tugs are provided at ‘occupaverunt’ (‘have invaded’) with another semitone; ‘Moestum factum est cor meum’ (‘My heart has been made dejected in grief’), which is homophonic and uses the fauxbourdon texture that frequently signals heightened emotion in this repertory; and most obviously at ‘Vae mihi’ (‘Woe unto me’) with block chords high in the choir’s range, and chromaticism that is not written in, but forced by the rules of musica ficta, producing a wrenching harmonic shift that underlines the anguish conveyed by the text. The second section of the piece changes its outlook entirely, trusting in God’s care for those who hope in him (‘sperantes in te’—again highlighted with homophony). Finally the text, emulating Job in its willingness to bless God despite extreme misery, states ‘may your name be blessed now and always’: the final phrase ‘et in saecula saeculorum. Amen’ is subjected to sequential treatment, with a waterfall-like figure that Clemens evidently felt bore repetition in toto. Peccantem me quotidie was a popular choice of text for Renaissance composers, being set by Byrd, Lassus, and Palestrina among the great names of the later sixteenth century, as well as Clemens, his contemporaries Thomas Crecquillon and Pierre de Manchicourt, and numerous more obscure figures (Manchicourt’s setting has been recorded by The Brabant Ensemble on Hyperion CDA67604). The text, a Respond from the Office for the Dead, is treated in its correct liturgical form by Clemens, though there is no evidence that it was intended as part of a liturgical cycle. Just as in Tristitia et anxietas, Clemens appears to have focused his compositional energies partly on directly text-expressive manoeuvres, and partly on musical gestures. The former is exemplified by the opening rising fourth followed by a downward tone, a frequent mournful opening as found—to name but one place—in the ‘Emperor’s song’ Mille regretz attributed to Josquin Des Prez. A second instance is the text line ‘Miserere mei, Deus’ (‘Have mercy on me, God’) which concludes both sections, where the texture is rapidly thinned down to two voices in an open fifth, emphasizing the penitential utterance with a rising and falling semitone—another device of Josquin’s, found especially in his motet on the ‘Miserere’ text. Sonorous invention is heard just before this moment in the first section, where ‘quia in inferno’ (‘for in hell’) brings a sequence descending to the depths followed by a static setting of the word ‘nulla [est redemptio]’ (‘there is no [redemption]’). In the second section, conversely, Clemens composes a rare rising sequence for ‘libera me’ (‘free me’), each repetition taking five beats and therefore breaking the regular pulse as if the vocal line is discarding its rhythmic shackles. Clemens set the text Erravi sicut ovis (‘I have wandered like a sheep’) twice, once for four voices and once for five. The five-voice setting recorded here doubles the alto register, with an ostinato repeating the Prodigal Son’s plea ‘Father, I have sinned against heaven and in your presence: now I am not worthy to be called your son. Make me as one of your servants’. The mood in the first section is supplicatory rather than anguished, with increased intensity in the final third of the piece, at ‘quoniam speravi in te’ (‘for I have trusted in you’), where the lower three voices become more rhythmical and the tessitura rises as the prayer requests to be surrounded with joyfulness (‘circumda me laetitia’). L’autre aspect de l’écriture de Clemens qui retient l’attention de l’auditeur, c’est le maniement de l’harmonie. Parler d’harmonie à propos de la polyphonie du XVIe siècle, c’est risquer de se voir taxer d’anachronisme; mais à mon sens (et en partie pour la raison développée dans le dernier paragraphe), Clemens peut être, bien plus que ses contemporains, utilement envisagé ainsi. Même si des passages en blocs d’accords existaient déjà dans la musique sacrée antérieure à son époque—généralement à des moments d’extrême solennité comme le nom de Jésus Christ dans la messe–, Clemens, dans les motets présentés ici, mélange très souvent l’écriture en accords au flux, plus large, de la polyphonie, pour des effets qui semblent avoir moins trait à l’illustration du texte qu’à la forme, voire à des concepts plus abstraits. Ce que montre bien le court (et fort inhabituel) motet Vae tibi Babylon et Syria, sur un texte emprunté au deuxième livre apocryphe d’Esdras relatif à la destruction imminente des cités hostiles aux Juifs. Les habitants de ces cités sont invités à se couvrir de cilices et de haires: ce verset est prolongé sur presque deux minutes de musique, durant lesquelles l’attitude quelque peu agressive du début de la pièce se relâche lentement jusqu’au sobre «plangite filios vestros» («pleurez vos enfants»). L’élan de la partie de basse, ralenti, passe à des semi-brèves et à des brèves, tandis que les trois voix supérieures sombrent peu à peu, séquentiellement, sur un ambitus d’une octave. Ici, la réduction manifestement délibérée de la tension crée un sentiment de désespoir exténué, qui ne peut être que partiellement adouci pour les derniers mots «quoniam appropinquavit perditio vestra» («car votre anéantissement est proche»). Ailleurs dans ces motets, Clemens adopte d’autres stratégies formelles apparemment indépendantes du texte. Ainsi dans le vaste motet tripartite De profundis, qui met en musique le psaume 130, la première section s’achève sur une longue séquence descendante à «Domine, quis sustinebit?» («Seigneur, qui pourrait le supporter?»). À ce moment précis, la texture est pleine: les deux plus graves des cinq voix évoluent régulièrement en minimes et en tierces parallèles, cependant que le soprano et un des altos adoptent un rythme dactylique (semi-brève–minime–minime), là encore en mouvement essentiellement parallèle. Pendant ce temps, la quinta pars (le second alto), rythmiquement bien plus active, syncope avec des semi-minimes et des minimes contre le tactus dominant. Aucune voix ne vient juste sous-tendre le texte (et les indications figurant dans les sources du XVIe siècle ne nous aident guère), renforçant l’impression que ce passage fut davantage voulu comme une unité sonore que comme l’expression spécifique de ces mots. Cela semble encore plus évident à la fin de la section terminale, quand une version retravaillée de la même séquence réapparaît, mais en mesure ternaire—les quatre temps d’une unité séquentielle dans la première énonciation font alors non pas une brève mais une brève un tiers et le modèle accentuel s’en trouve ingénieusement déplacé. Si de tels passages quasi instrumentaux suggèrent un compositeur parfaitement en phase avec la sonorité, ailleurs dans le De profundis, Clemens dément toute hypothèse selon laquelle il pouvait ne pas se soucier du texte. Plus tôt dans la troisième section, le mot «misericordia» est traité homophoniquement, avec un parfait accent humaniste; et vers le début de la pièce, «Si iniquitates» («Si [tu gardais le souvenir] des iniquités») est chanté en homophonie—même s’il est aussi répété à une hauteur de son plus élevée pour un effet émotionnel accru. Globalement, ce De profundis compte parmi les réalisations les plus impressionnantes de Clemens, une structure musicale indépendante qui court sur presque dix minutes. De même envergure, Tristitia et anxietas est encore plus long une fois chanté, malgré des valeurs de note un peu plus courtes. Longtemps, les étudiants en polyphonie renaissante ont connu ce motet pour son apparente influence sur le Tristitia et anxietas de William Byrd, signalée pour la première fois par Joseph Kerman; toutefois, comme la plupart des motets gravés ici, il ne semble pas encore avoir été enregistré. Son ton angoissé est instauré par le point imitatif inaugural qui, à la manière de ce qui se passe chez Nicolas Gombert, l’éminent aîné de Clemens, serpente lentement et tortueusement autour d’une seule hauteur de son, avec un premier mouvement d’un demi-ton. D’autres saccades émotionnelles surviennent à «occupaverunt» («ont envahi»), avec un nouveau demi-ton; à «Moestum factum est cor meum» («Mon cœur s’est abattu de douleur»), qui est homophonique et utilise la texture en faux-bourdon, souvent signe, dans ce répertoire, d’une émotion accrue; et la plus visible de toutes, à «Vae mihi» («Malheur à moi»), avec des blocs d’accords dans les aigus du chœur et un chromatisme qui n’est pas écrit mais dicté par les règles de la musica ficta, d’où une violente transition harmonique soulignant l’angoisse charriée par le texte. Dans un revirement de perspective, la seconde section de la pièce se montre confiante dans le soin que Dieu prendra de ceux qui espèrent en lui («sperantes in te»—là encore souligné par de l’homophonie). Pour terminer, le texte, imitant Job dans son enthousiasme à bénir Dieu malgré son extrême misère, énonce «que ton nom soit béni maintenant et à jamais»: la phrase finale, «et in saecula saeculorum. Amen» est soumise à un traitement séquentiel, avec une figure cascadante que Clemens trouva manifestement lassante à répéter in toto. Peccantem me quotidie était un texte populaire parmi les compositeurs de le Renaissance: plusieurs grands noms du XVIe siècle—Byrd, Lassus et Palestrina, sans oublier Clemens et ses contemporains Thomas Crecquillon et Pierre de Manchicourt (la version de ce dernier a été enregistrée par The Brabant Ensemble sur le disque Hyperion CDA67604)—mais aussi maints noms plus obscurs le mirent en musique. Ce répons destiné à l’office des morts est traité ici sous sa forme liturgique correcte, même si rien ne prouve qu’il ait été conçu pour un cycle liturgique. Comme dans Tristitia et anxietas, Clemens semble avoir concentré son énergie et sur des manœuvres exprimant directement le texte, et sur des gestes musicaux. Les premières sont illustrées par la quarte ascendante inaugurale, suivie d’un ton descendant—une fréquente ouverture douloureuse comme on en trouve, pour ne citer que lui, dans le «Chant de l’empereur» Mille regretz, attribué à Josquin Des Prez. Un second exemple de manœuvres nous est fourni par le verset «Miserere mei, Deus» («Prends pitié de moi, Seigneur»), qui termine les deux sections et où la texture, rapidement réduite à deux voix dans une quinte à vide, accuse l’énonciation pénitentielle par un demi-ton ascendant et descendant—un procédé que l’on retrouve chez Josquin, notamment dans son motet sur le texte du «Miserere». L’invention sonore se fait entendre juste avant, dans la première section, quand les mots «quia in inferno» («car en enfer») précipitent une séquence dans les profondeurs, avant une statique énonciation du terme «nulla [est redemptio]» («[il n’y a] nulle [rédemption]»). Dans la seconde section, en revanche, Clemens conçoit une rare séquence ascendante pour «libera me» («délivre-moi»), chaque répétition prenant cinq temps et rompant donc la pulsation régulière, comme si la ligne vocale se dépouillait de ses entraves rythmiques. Clemens signa deux Erravi sicut ovis («J’ai erré tel un mouton»), l’un à quatre voix, l’autre à cinq. Ce dernier, enregistré ici, double le registre d’alto, avec un ostinato répétant la supplique du fils prodigue: «Père, j’ai péché contre le ciel et en ta présence: maintenant, je ne suis pas digne d’être appelé ton fils. Fais de moi l’un de tes serviteurs.» Le climat de la première section est non pas angoissé mais suppliant, avec une intensité accrue dans le dernier tiers de la pièce, à «quoniam speravi in te» («car j’ai cru en toi»), quand les trois voix inférieures se font plus rythmiques et quand la tessiture s’élève, au moment où la prière demande à être entourée de joie («circumda me laetitia»). Der zweite Aspekt des Kompositionsstils Clemens’, der die Hörer anzieht, ist die Manipulation der Harmonie. Den Terminus „Harmonie“ in Bezug auf Polyphonie des 16. Jahrhunderts anzuwenden, lädt die Missbilligung derer, die den Begriff für anachronistisch halten, geradezu ein; ich bin jedoch (zum Teil aus dem Grund, den ich oben ausgeführt habe) der Ansicht, dass man gerade im Falle von Clemens derartige Termini anwenden kann—mit deutlich größerer Berechtigung als bei seinen Zeitgenossen. Obwohl sich Blockakkord-Passagen in geistlicher Musik schon lange vor seiner Zeit finden lassen, zumeist bei besonders feierlichen Momenten, wie etwa der Nennung des Namens Jesu Christi in der Messe, bindet Clemens mehrmals in den hier vorliegenden Motetten Akkordblöcke in den weiteren polyphonen Rahmen ein, um so Effekte zu erzeugen, die mehr mit Form oder noch abstrakteren Konzepten zu tun haben als mit der Illustration des Texts. Ein Beispiel hierfür findet sich in der kurzen (und äußerst ungewöhnlichen) Motette Vae tibi Babylon et Syria, deren Text aus dem apokryphen 2. Buch Esdras stammt, in dem es um die drohende Vernichtung von Städten geht, die den Juden feindlich gesinnt sind. Die Einwohner dieser Städte werden dazu aufgefordert, sich in Sackleinen und Büßerhemden zu kleiden: diese Textzeile erstreckt sich über fast zwei Musik-Minuten, in denen die recht aggressive Haltung vom Beginn des Stücks allmählich ruhiger wird und sich zu dem gedämpften „plangite filios vestros“ („beweint eure Kinder“) hinbewegt. Die Bewegung der Bassstimme verlangsamt sich auf Semibreven und Breven, während die drei Oberstimmen allmählich und sequenzartig eine Oktave hinabsinken. Das offensichtliche Nachlassen der Spannung in dieser Passage erzeugt eine Stimmung der Erschöpfung und Verzweiflung, die nur teilweise beim letzten Text, „quoniam appropinquavit perditio vestra“ („denn euer Untergang steht bevor“) überwunden werden kann. An anderer Stelle in seinem Motetten-Oeuvre arbeitet Clemens mit unterschiedlichen formalen Strategien, die unabhängig von der Textvertonung zu sein scheinen. In der großen, dreiteiligen Motette De profundis, zum Beispiel, eine Vertonung von Psalm 130, endet der erste Teil mit einer ausgedehnten, abwärts gerichteten Sequenz bei „Domine, quis sustinebit?“ (“Herr, wer wird bestehen?“). Die Struktur an dieser Stelle ist voll, wobei die beiden tiefsten der fünf Stimmen sich stetig in Minimen und in Terzparallelen bewegen, während der Sopran und eine der Altstimmen einen daktylischen Rhythmus (Semibrevis–Minima–Minima) annehmen und sich ebenfalls hauptsächlich in Parallelen bewegen. Die quinta pars, oder der zweite Alt, hingegen ist rhythmisch deutlich aktiver und setzt mit Semiminimen und Minimen synkopisch gegen den vorherrschenden Tactus. Keine der Stimmen ist eine direkte Textvertonung (und in den Quellen des 16. Jahrhunderts ist die Textverteilung auch nicht klar angegeben), was den Eindruck verstärkt, dass diese Passage in erster Linie als klangliche Einheit angelegt wurde und der Text eine untergeordnete Rolle spielt. Dies wird wiederum bestätigt, wenn eine umgeänderte Version derselben Sequenz am Ende des Schlussteils wiederkehrt, diesmal jedoch im Dreierrhythmus, so dass die vier Schläge einer Sequenz-Einheit aus der ersten Version nun eineindrittel Breven und nicht mehr eine Brevis ergeben und die Akzente damit raffiniert verschoben werden. Wenn solche quasi-instrumentalen Passagen andeuten, dass der Komponist sich in erster Linie mit dem Klangbild beschäftigte, so weist Clemens anderswo in De profundis die Vermutung zurück, dass er die Textvertonung vernachlässigt habe. Etwas vorher im dritten Teil wird das Wort „misericordia“ („Erbarmen“) homophon und mit perfekter humanistischer Wortbetonung behandelt; und zu Beginn des Stücks wird „Si iniquitates“ („Wenn Verstöße“) nicht nur homophon gesungen, sondern auch in höherer Tonlage wiederholt, um den emotionalen Effekt zu steigern. De profundis als Ganzes ist eine der eindrucksvollsten Errungenschaften Clemens’—eine freistehende musikalische Struktur mit einer Länge von fast zehn Minuten. Eine ähnliche Anlage findet sich in Tristitia et anxietas, das zwar etwas kürzer ist, was die Notenwerte anbelangt, jedoch eine längere Aufführungsdauer hat. Unter Forschern der Renaissance-Polyphonie ist diese Motette schon seit langem bekannt, da sie offenbar ein wichtiger Einfluss auf die Vertonung desselben Texts von William Byrd war, was erstmals von Joseph Kerman aufgezeigt wurde; wie der Großteil der hier vorliegenden Motetten scheint sie jedoch bisher noch nicht eingespielt worden zu sein. Der schmerzvolle Ton des Werks stellt sich bei dem imitativen Kontrapunkt zu Beginn ein, der sich im Stile von Nicolas Gombert (der bedeutende, ältere Kollege Clemens’) langsam um eine Tonlage herumwindet, wobei das Anfangsintervall ein Halbton ist. Weitere offensichtlich gefühlsbetonte Passagen finden sich bei „occupaverunt“ („sind eingedrungen“), ebenfalls mit einem Halbton; bei „Moestum factum est cor meum“ („Mein Herz ist traurig gemacht worden“), das homophon gehalten und wo ein Fauxbourdon eingesetzt ist, der in diesem Repertoire oft erhöhte Emotionen signalisiert; sowie, am auffälligsten, bei „Vae mihi“ („Wehe mir“), wo Blockakkorde am oberen Ende des Tonumfangs des Chors und auch chromatische Passagen erklingen, die zwar nicht als solche notiert sind, sich aber durch die Regeln der Musica ficta zwangsläufig ergeben, was für einen drastischen harmonischen Wechsel sorgt, der den im Text ausgedrückten Schmerz unterstreicht. Im zweiten Teil des Werks ändert sich die Perspektive völlig—es vertrauen sich diejenigen Gott an, die ihre Hoffnung auf ihn setzen („sperantes in te“—wiederum mit Homophonie untermauert). Schließlich erklingen im Text die Worte „möge dein Name geheiligt werden, jetzt und immerdar“—ähnlich wie bei Hiob, der trotz seinem extremen Elend Gott preist—und die letzte Phrase „et in saecula saeculorum. Amen“ wird mit Sequenzen behandelt, wobei eine wasserfallartige Figur erklingt, von der Clemens derartig angetan war, dass er sie noch einmal komplett wiederholte. Peccantem me quotidie war unter Renaissance-Komponisten ein beliebter Text und wurde von Byrd, Lassus und Palestrina, um nur einige der großen Namen des späteren 16. Jahrhunderts zu nennen, vertont, und auch von Clemens, seinen Zeitgenossen Thomas Crecquillon und Pierre de Manchicourt sowie einer Reihe von unbekannteren Meistern (eine Aufnahme der Vertonung von Manchicourt mit dem Brabant Ensemble liegt auf Hyperion CDA67604 vor). Der Text ist ein Responsorium aus der Totenmesse und wird von Clemens in der korrekten liturgischen Form verwendet, obwohl es keine Hinweise darauf gibt, dass das Werk als Teil eines liturgischen Zyklus gedacht gewesen wäre. Ebenso wie bei Tristitia et anxietas scheint sich Clemens hier teilweise auf die Textvertonung und teilweise auf musikalische Gesten konzentriert zu haben. Ersteres zeigt sich etwa bei der aufsteigenden Quarte zu Beginn, auf die ein abwärts gerichteter Ganzton folgt: eine häufig eingesetzte Figur bei trauervollen Anfängen, die auch, um nur ein Beispiel zu nennen, in dem „Kaiserlied“ Mille regretz erklingt, das Josquin Des Prez zugeschrieben wird. Ein weiterer solcher Moment ist bei der Textzeile „Miserere mei, Deus“ („Erbarme dich meiner, Gott“), mit der beide Abschnitte beendet werden und wo die Textur sich rasch auf zwei Stimmen reduziert, die in einer leeren Quinte erklingen, wodurch der bußfertige Ausdruck mit einem ansteigenden und abfallenden Halbton betont wird—ein weiteres Stilmittel Josquins, das sich insbesondere in seiner Motette über den „Miserere“-Text findet. Klanglicher Einfallsreichtum äußert sich zum Beispiel kurz vor diesem Augenblick im ersten Teil, wo „quia in inferno“ („denn in der Hölle“) eine Sequenz mit sich bringt, die in die Tiefe hinabsteigt und auf die eine statische Vertonung des Wortes „nulla [est redemptio]“ („es gibt keine [Erlösung]“) folgt. Im zweiten Teil hingegen komponiert Clemens eine seltene aufsteigende Sequenz für „libera me“ („befreie mich“), wobei jede Wiederholung fünf Schläge hat und damit den regelmäßigen Puls durchbricht, als ob sich die Vokallinie von ihren rhythmischen Fesseln lösen würde. Clemens vertonte den Text Erravi sicut ovis („Ich irrte umher wie ein Schaf“) zweimal, einmal für vier Stimmen und einmal für fünf. In der hier vorliegenden fünfstimmigen Vertonung ist die Altstimme verdoppelt, wobei ein Ostinato die Bitte des verlorenen Sohns wiederholt: „Vater, ich habe gesündigt gegen den Himmel und vor dir, ich bin es nicht mehr wert, dein Sohn genannt zu werden. Mache mich zu einem deiner Knechte.“ Die Stimmung im ersten Teil ist eher flehend als schmerzvoll, wobei sich im letzten Drittel des Werks eine stärkere Intensität bei den Worten „quoniam speravi in te“ („da ich auf dich hoffte“) einstellt, wo die drei tiefen Stimmen rhythmischer werden und die Gesangslage ansteigt, wenn im Text darum gebeten wird, von Freude umgeben zu werden („circumda me laetitia“).